The Wikipad is a gaming tablet device revealed at CES earlier this year, and it's slowly moving from idea to reality. The company behind the tablet (also known as Wikipad, go figure) has announced the final specs for the design, and they're hot: The display will be 10.1 inches with a 16:10 1280x800 resolution, the tablet will be powered by an Nvidia Tegra 3 T30 1.4 GHz processor, and it will run with 1 GB of DDR2 RAM, and at least 16 GB of internal Flash memory storage. Android 4.1 will power the OS, and an onboard 23.46Wh battery will go for six hours of gaming and eight hours of video playback. There will be an 8 megapixel camera on the back, as well as a 2 megapixel camera on the front. An early model this year featured a 3D display, but the final version will opt for 2D. For the casing itself, Wikipad is going with a flat-backed shape with rounded corners, both slightly thicker, but also lighter, than the iPad 2. The controller add-on, which you can see above, is similar to a current-gen gaming controller (complete with triggers and buttons on the back) and will come with the unit. A price and release date haven't been officially announced yet, but Wikipad is planning to have its namesake device out later this year. 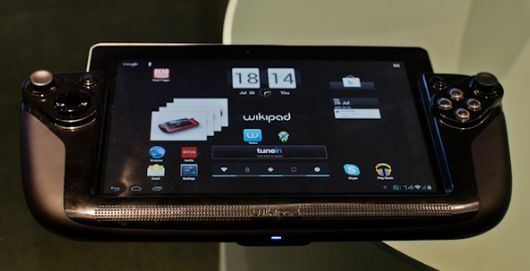 Wikipad specs revealed, will run Android 4.1 games on a 10.1" screen originally appeared on Joystiq on Tue, 31 Jul 2012 01:30:00 EST. Please see our terms for use of feeds. I'm not really sure why this needs to exist. Seems like it would be easier to just make a quality Bluetooth controller for existing tablets.